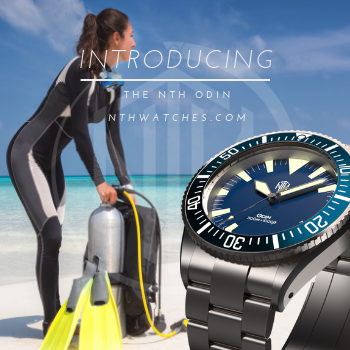 Every time a new watch is released, a chorus of self-proclaimed experts crawls out of the woodwork to criticize it. "Oh sure," they say, "it's pretty cool, but the date wheel should have been black," or "I wish it were available in green," or "The second had should have been yellow, not red! The red hand is a travesty!" I know this because I'm one of them, and if you are reading this, I'll bet you are too. Second-guessing watch designers is great fun, but what if you had the ability to design your watch, your way? Undone is a new venture that aims to do just that, giving you the ability to mix and match a variety of colors, finishes, and parts to create a watch that is uniquely yours. They may not be the only company to offer this (Swedish brand, Fewsome springs to mind), but it is not a common service, and certainly nothing I had tried before. Undone let The Time Bum whip up his own creation for this review. Undone's first model is the Aqua, a 200m diver with a screw-down crown, sapphire crystal, and wedge-shaped date magnifier. Its movement is a trusty Seiko NH35, a hacking, hand winding, 21 jewel automatic that runs at 21.6k bph. 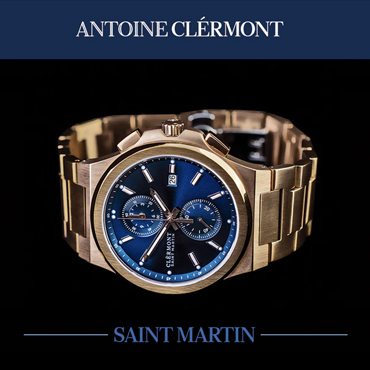 The stainless steel case is appropriately burly measuring 45mm wide, 52mm long, and 15mm thick. Large, wedge-shaped guards taper around an octagonal crown cast with the Undone "U." The coin edged bezel is unidirectional. It moves easily through its 90 positions with loud clicks and just a touch of back play. A recessed section of steel between the long lugs bridges the gap between the barrel and the spring bars. The case is polished on the sides while the top is brushed. I like the overall shape, but the overall level of finish could be improved. The brushing shows pronounced grain and the inside edge of the lugs is too sharp for my liking. These are the basics. From this point on, you order your Aqua a la carte through their online Customizer. Start with the case. All Aqua cases are the same but with different finishes. I chose silver steel. PVD options include black, gun metal, gold, and rose gold. That selection made, you pick your bezel insert, either cut ceramic in your choice of four colors with raised, polished markers on a matte background, or K1 glass with bright luminous markers. It is hard to make a bad choice here. I opted for the vintage look of domed glass. You have a dizzying array of colors from which to choose, but I went with the classic white on black. The dial is next. It has numbers at 12, 6, and 9, a 3 o'clock date window, and bars for the remaining markers and the index. This is where you really get to play as you click through the different choices. Do you want colored markers, lumed markers, or black? 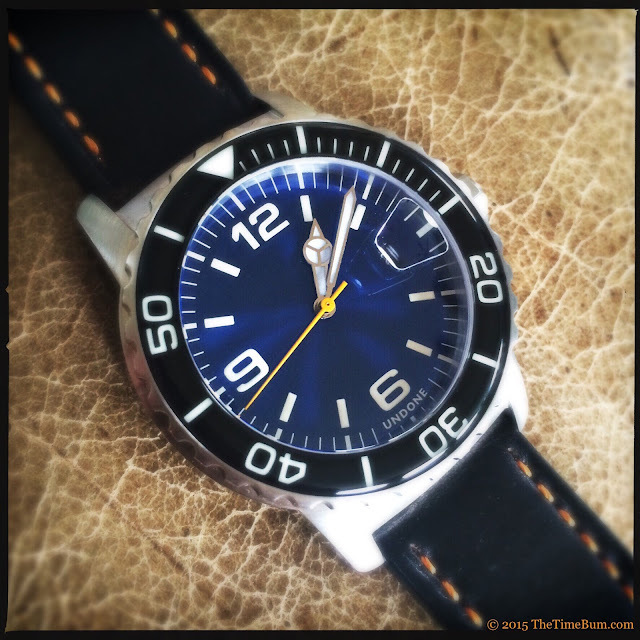 Matte dial, glossy, carbon, or sun ray? Perhaps pink camouflage is more to your liking? Undone can also print small batches with a custom design or company logo. I considered this, but as you may have noticed, The Time Bum is not a graphic designer and does not have a particularly dial-friendly logo. 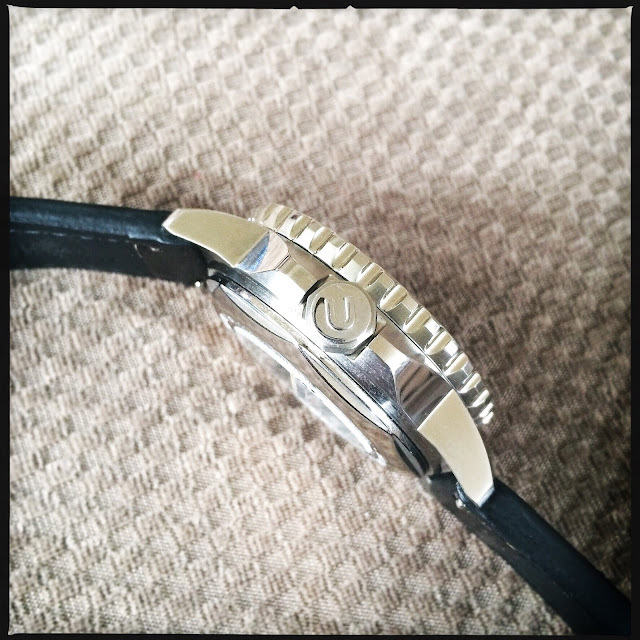 As is, Undone has discreetly tucked their brand name below the 6, leaving the dial clean. Considering all the times I have criticized watch designers for needless clutter and ugly logos, I felt it best to leave well enough alone. 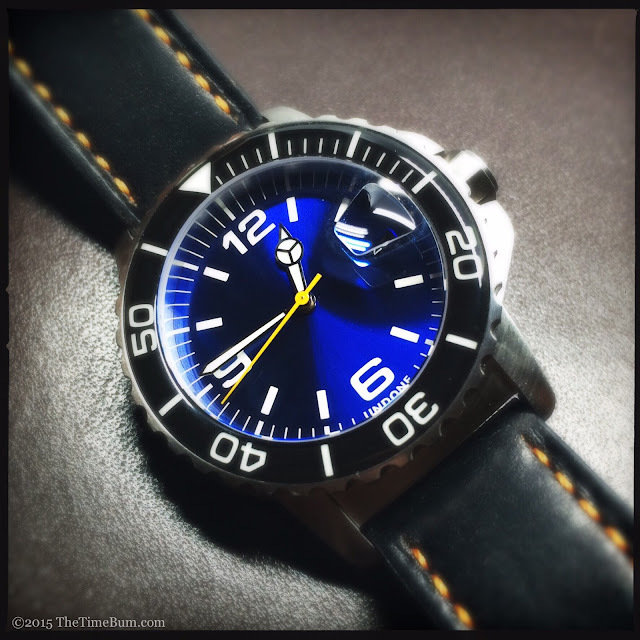 I chose a shimmering deep blue sunray with white lume markers and nothing else. You many choose from three handsets: sword, "Mercedes" poire squelette, or a rounded wedge. Of course, there are numerous colors from which to choose, as well as luminous and non-luminous options. There is only one style of second hand, but the color is up to you. Now to be clear, the color you are selecting is the fill. The frames are either black or polished, depending on fill color selection. I understand why this is, after all, it is far easier to change the fill than to paint the hands, but I wish I could have chosen a bright hand color with white lume. As it was, I went with a traditional polished Mercedes handset with white lume. 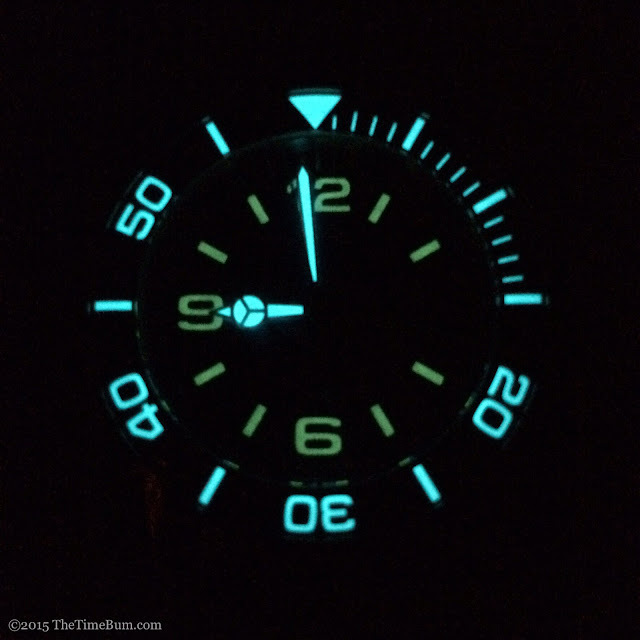 The glow from the hands was as bright as that of the bezel, but faint on the dial markers. As mentioned above, the only movement available is the NH35, and I have no qualms about that. Lest you think you have no options, you can choose your date wheel. I went for white-on-black, but in retrospect, I wish I had chosen black-on-white as it might have better balanced those big white numbers. 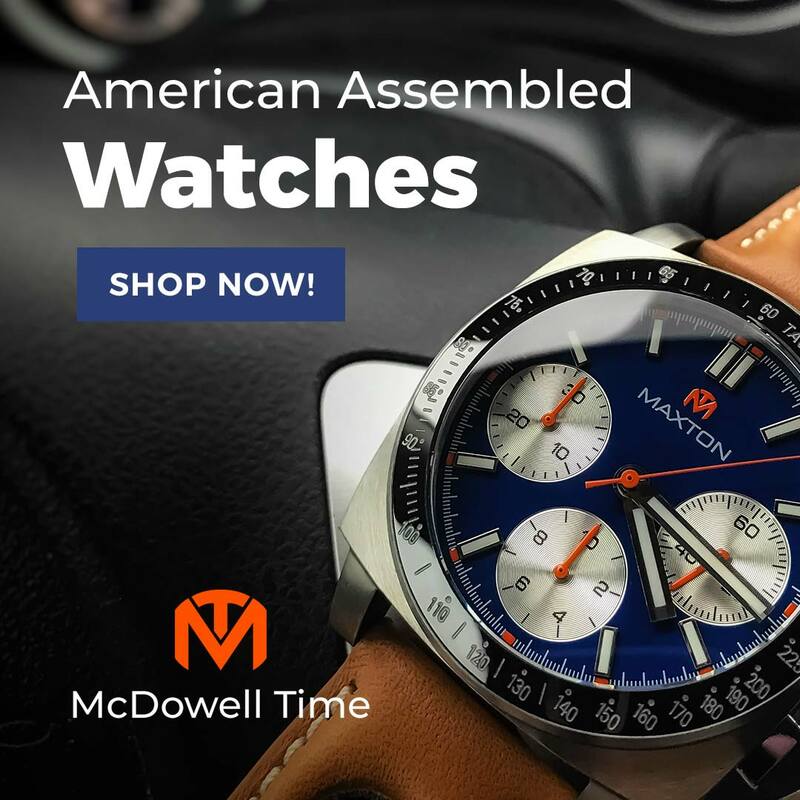 A watch with so many options certainly must have an equally impressive selection of straps and Undone does not disappoint in this department, offering Horween oil tanned leather, Italian leather, suede, bund style, rubber, or alligator print, each in a variety of colors. I chose a black calfskin leather with orange stitching. 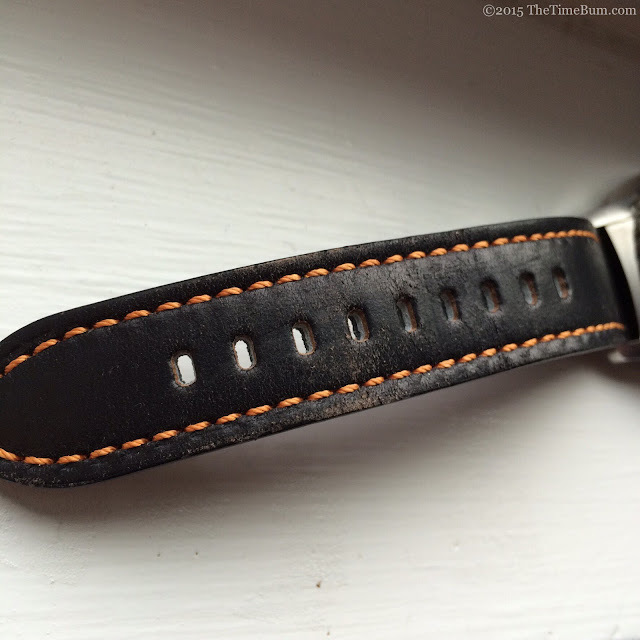 This standard calfskin strap does not appear to be an option anymore and I must say that is a good thing because the quality was very poor. After just three days, the finish was cracking and wearing through. I can only assume the current options are better. 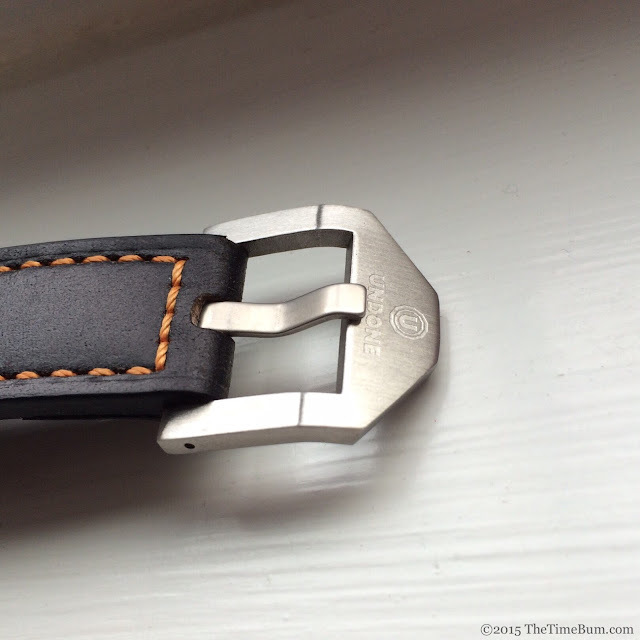 The attractive engraved buckle was also a letdown as its edges and corners are unpleasantly sharp. The buckle did not make contact with my wrist, but it feels unfinished. The final step us to specify a solid or display case back, and any engraving or printing you may wish. 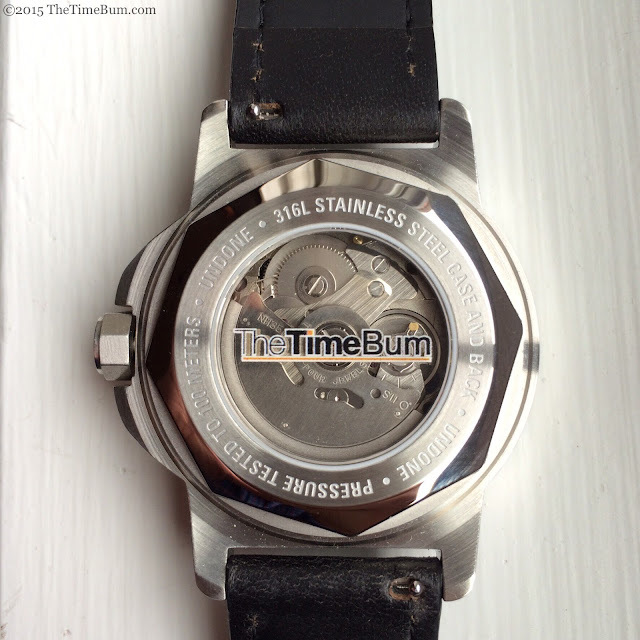 I refrained from printing The Time Bum on the dial, but I was ready and willing to tattoo it across the watch's behind. It is printed on the display glass in all of its black, white, and orange glory. With the options chosen, my watch was $430. I submitted my PayPal info and waited. My package arrived in short order, and I eagerly peeled it open. Now I don't generally care about packaging unless it is something special. In this case, that something was my site name. There is was, printed on the outer box for all the see and enjoy, "The Time Bum." It was too magnificent – but wait! It gets better. 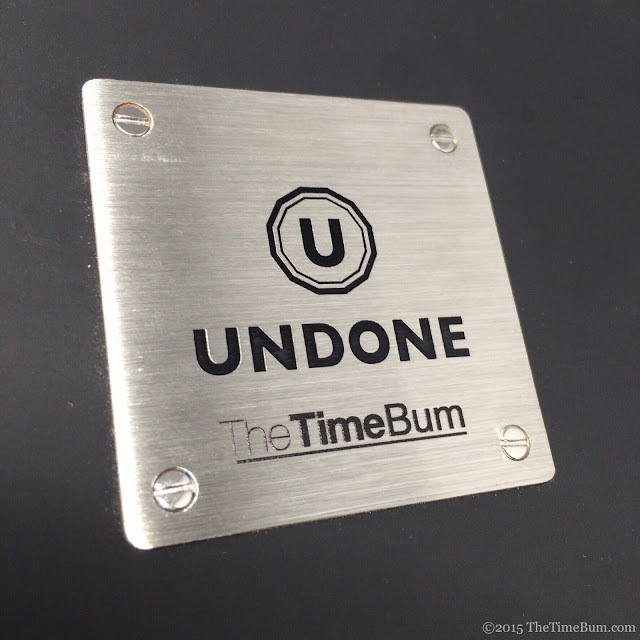 The Time Bum was also engraved on a metal plate screwed to the display box. In the great scheme of things, I'll admit this might not be such a big deal, but it felt damn good to see my name on there. Clearly, Undone understands that magic moment when the customer opens the box. I have been wearing my Undone very special Time Bum Edition for a few days now, and overall I'm pleased. I love the fact that I chose the options that were right for me, and it tickles me to know this watch has my name on it (or at least, my online alter-ego's name). Is there anything I would change about my selections? Sure. I'd have gone with a white date wheel, a different strap for sure, and I could have been a tad more adventurous in my selections. Would I change anything about what Undone has to offer? Yes. The buckle needs work, the bezel action could be tighter, and some of the finishing on the case could be improved, but still and all, designing my Undone was an absolute blast, and the result is mighty cool. Other criticisms? Well, I can hardly jab them for more selection but I will anyway. 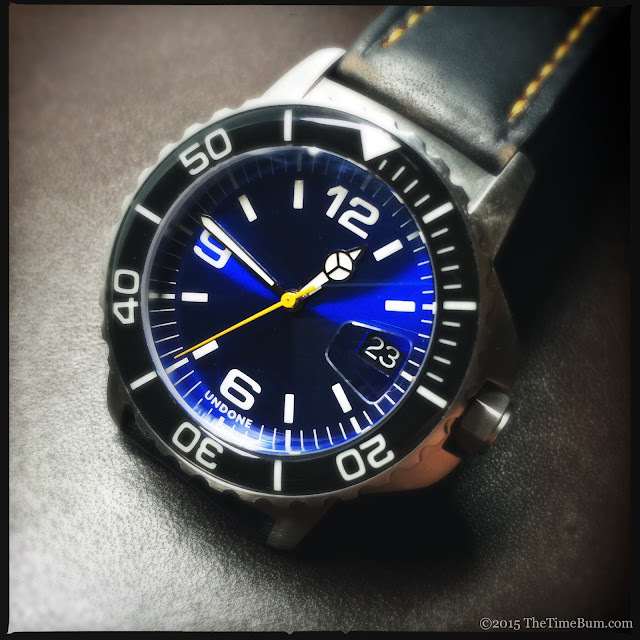 I would like to see a no-date option, a no-magnifier option, more hand colors than just black and silver, and second dial option would have been nice, but given all the choices that exist, I'm just getting greedy. I know Undone has two new models in the works, The Hemisphere and The Terrain, so it will be interesting to see what direction they take. I highly recommend a visit to the Undone site. 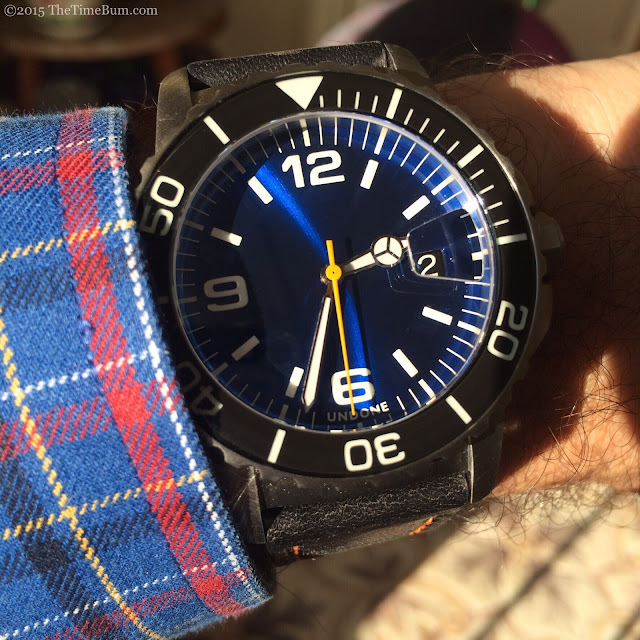 You will have great fun on the Customizer, and you might just design your perfect watch. Do it soon, because Undone will give Time Bum readers 20% off until December 1 with the code THETIMEBUM. 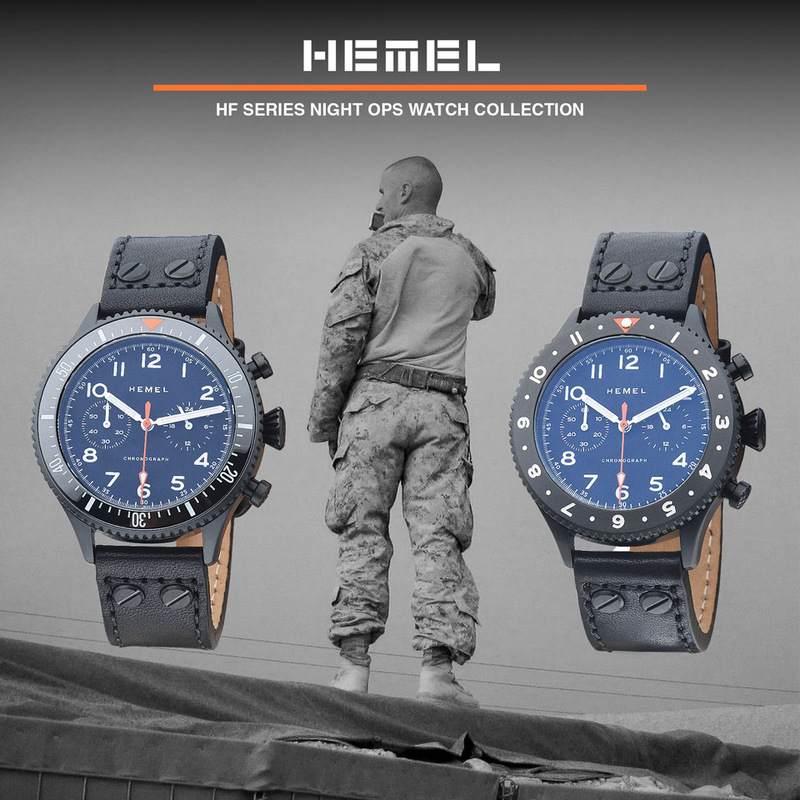 Pro: A watch tailored to you. Con: You'd better have a spare buckle. Sum: A one-of-one, by you, for you. Check it out.